Bashundhara Liquefied Petroleum Gas Limited (BLPGL), an enterprise of the Bashundhara Group, has set up country’s only and mega facility for making international standard gas cylinder at Sundarban Industrial Complex at Mongla. 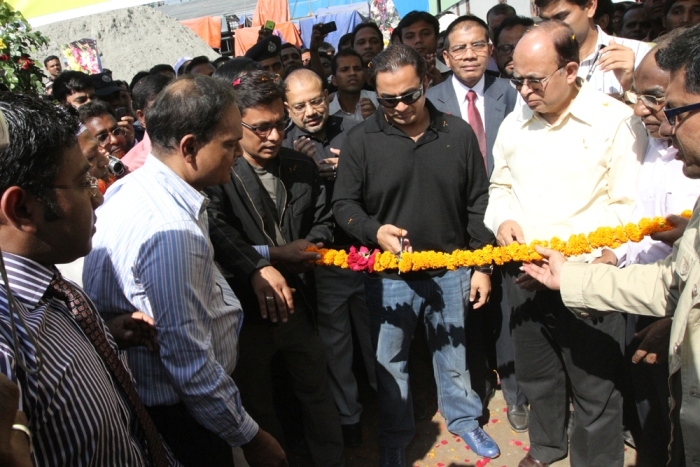 Managing Director of the Bashundhara Group Mr. Sayem Sobhan inaugurated production of the plant at a simple function at the plant premises this morning (November 25, 2011). Senior Deputy Managing Director Mr. Belayet Hossain, Deputy Managing Director Mr. Mustafizur Rahman, Senior Executive Director Mr. Mahbubuzzaman, Advisor Press & Media Mohammad Abu Tayeb of the Bashundhara Group, General Manager Sales & Marketing Mr. Shahin Ahmed, General Manager Operations Engineer Zahid among others attended the inaugural function. The Bashundhara Liquefied Petroleum Gas Limited, since its inception, has solely been depending on the gas cylinders produced at one of its sister concern – the Bashundhara Steel Complex Limited (BSCL) at Manikganj. In the backdrop of fast depleting reserve of the natural gas, the government in the recent years started encouraging private entrepreneurs to promote bottled LPG as alternative fuel for domestic purposes and smal industries. In response to the state policy as well as the increasing demand of alternative fuel mainly among the population out of the natural gas distribution network and catering the emerging groups of consumers, the BLPG undertook the mega project at a cost of Taka 1000 million more than a year ago. The project has been implemented under the technical support from two Chinese companies – Hunan Technical Import and Export Corporation and Jiangyan City Yuehai Manufacturing Company Limited. The installed production capacity of the plant is 100 thousand cylinders of different size a month. It is also expected that the existing LPG marketing companies to share the production of the plant for enhancing supply of the LPG at the market. Currently the BLPG takes LPG feed from Petronas Trading Corporation of Malaysia and delivers as much as 32000 metric tons of gas to the consumers after bottling at the plant. The company hopes to double its production 640000 metric tons a year when new bottling plant goes into operation. Addressing a post inaugural briefing Deputy Managing Director of the Bashundhara Group Mr. Mustafizur Rahman said that the company would pursue the policy of serving the nation by offering pragmatic alternative to fuel crisis. “We’ll try hard to make the product affordable and available all over the country,” he said responding to a question regarding price of the refilled bottle of LPG.